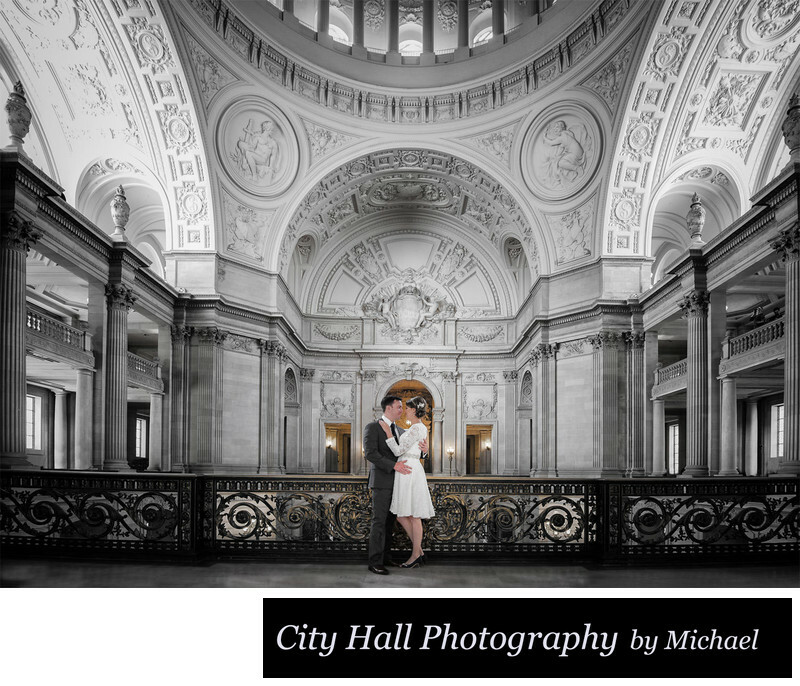 When comparing our prices and packages to other San Francisco city hall wedding photographers, be sure they are offering you ALL of the images and not limiting how many photos you are able to keep. Our image files are Full Resolution and are not water marked. All packages included full rights to do whatever you want to with the images. This includes sharing on Social Media, Websites, and making your own prints or wedding albums. There are no hidden charges or surprises. Some of our competitors only allow you to download a predetermined and limited number of image files. We have NO LIMITATIONS! You receive all of the image files we took at the wedding. Click the link to to see what makes our packages so affordable. Remember, true affordability is not just reflected in lower prices, it's more about what you receive for what you pay! We have listed our most popular mid-week packages, but many of our clients request a custom city hall Package. We can provide you any level of coverage you need, including packages with Wedding Reception coverage or an optional Wedding Album. We are happy to respond to your custom price quote request if you do not see the right package for you on our price list. Just let us know the level of coverage you want (How many hours, locations, wedding album options, etc.) We will respond back to you quickly with a price and package to fit your individual needs. One very popular custom package falls right between our Golden Gate Package and our San Francisco Package. We sometimes call it our Golden Gate PLUS package and it provides you with 2 locations after city hall and the cost is $1,095. Total coverage time is right around 3.25 hours. We can provide you with other options similar to this one. San Francisco City Hall also offers weekend ceremonies, please email us for our special weekend pricing. We proudly offer one of the most beautiful albums in the Wedding Photography industry. Our custom made Epoca City Hall wedding albums are designed by us with photos chosen by you! Your 24 page Flush Mount Panoramic album will be 8X11 inches in size and contain 40 images. You may also choose the beautiful full length cover photo that will adorn this amazing book. Don't put your romantic wedding images on a forgotten hard drive somewhere! Display your memories on your coffee table with this gorgeous wedding album. The price is $425 and includes everything listed above. Other sizes and price levels are available, just ask! This book is INCLUDED in the "Storybook Album" package listed on this page. Yes, you can make your own album with our images, but will you? Will it be this high quality? These are the realistic questions you need to ask yourself when making the decision to purchase an album. I can honestly say that not one of my clients has ever not been thrilled to receive our album. Many more have told us that they fully intended to make their own wedding album, but never got around to it. This is very common with brides and grooms, things get very busy after marriage! 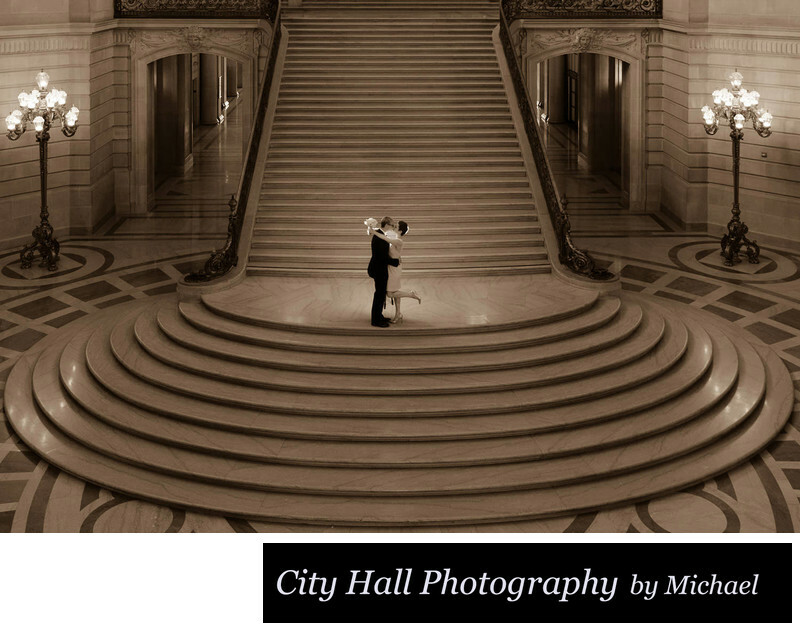 You can request your San Francisco City Hall wedding image files in many different formats. We can send you a USB Drive or we can "Dropbox" the images to you via File Transfer. We also now are offering Direct Download from your private website included with every city hall photography package. Yes, this private viewing site allows your family and friends the opportunity to check out your beautiful San Francisco city hall wedding photographs. Note: If you request a USB drive and you live in California we are required to collect applicable sales tax. All other digital transfer methods do not require that we collect tax. We are very prompt when it comes to your image preparation and editing. Your photos will be fully edited and ready to view within 3 weeks. Once you are ready, your Full Resolution Image files will be ready to directly download from your viewing site. We can also send by Dropbox if you prefer. If needed, we can also send you your images by shipping a USB drive to your home or business. California residents will need to pay sales tax for a USB drive by State law. We accept Visa, MasterCard, American Express, and Discover credit cards via PayPal. You do NOT need to have a Paypal account to use a credit card. We also accept cash, check or Venmo. A deposit of $350 is required to hold your wedding date for most packages. If you decide to book, we will send you a contract with all of your payment and package details. Your final payment is due 2 weeks after your wedding date for the balance of your package. Tax is only charged to California State clients who want a USB Drive. No tax needs to be collected for out of state clients or anyone receiving their image files by Direct Download or Dropbox. Ask us about discount programs. We offer special city hall wedding photography pricing for Veterans and Military personnel. In addition, certain times of the year may include special offers and programs. This includes Christmas, New Years and Valentine's Day.